I am relatively new to baconing. 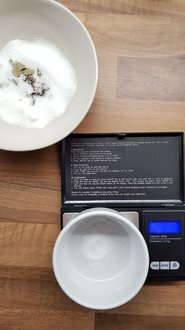 I've done a handful of cures over the last year or so, trying to work out the best, safest method from the MANY MANY recipes and differences of opinion on this on the internet. First with saltpeter and salt and sugar from a recipe in the guardian or telegraph or somewhere. 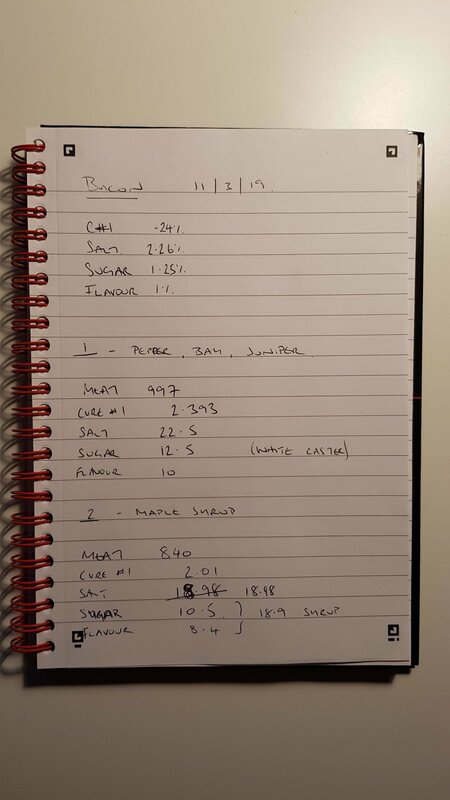 The potency of that stuff gave me the willies - never really felt comfortable with it despite using jewellers scales and double, triple checking my maths - so I shifted to Supracure from Weschenfelder, used at their 5%/6% guidance. Still wasn't fully feeling the safety of that (I have young kids who, if possible, I'd like to nurture to adulthood) and as it got damp and (ever so slightly) clumpy I had reservations about measuring it accurately (I guess the moisture levels make it denser, throwing off any weight calculations?). So I've kept going with my research. Which has brought me here. Hallelujah! I've been reading a lot of your posts over the last few days. Thank you Wade, especially, for your very clear advice and guidance. You guys seem to know what you're doing! This feels like a safe place to learn! I ordered some cure no1 from Weschenfelder yesterday and plan to do some streaky when it arrives next week. In advance of that I'm getting all my ducks in a row. - Plastic. I'm not a hippie, but I would rather avoid using disposable plastic if possible. Saving the planet one bag at a time, and all that. So I'd prefer not to vac-pac if I can get away with it. In your opinion would I be safe using the big shallow pyrex dish with tupperware lid thing that I have and turning the meat in the brine every day? It's the method I've been using so far and it seems to have worked. - Would I be able to do two separate cuts at the same time in this way, one stacked on top of the other (swappiing/turning daily)? 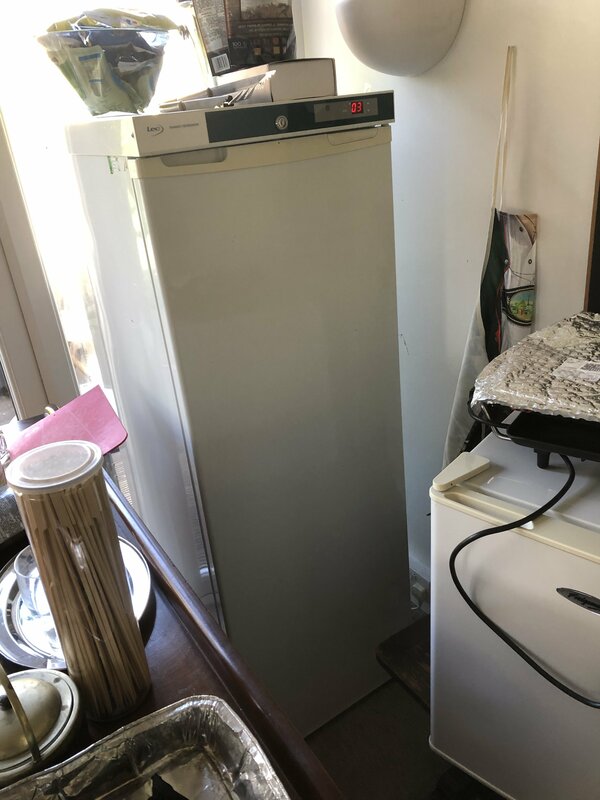 The dish is tall enough to still be coverable (so as not to contaminate the rest of my fridge) and I've seen youtube videos of people doing this. Were they wrong? - Duration. 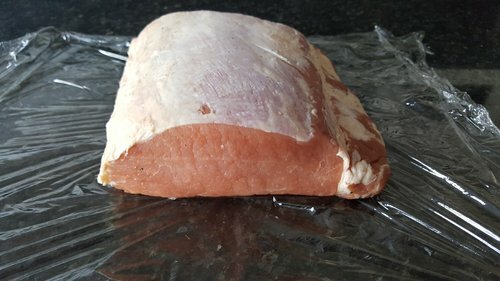 On previous belly/streaky attempts (usually on cuts about 1.5kg) I've been curing for 6 days (turning daily) and hanging afterwards for about the same time. This has been using what I now realise is Supracure's excessive 5% recommendation. If I drop down to 2.5% salt now, as you recommend, will 6-days non-vacpacked be long enough to cure? Do I need to cure for longer if I'm using less salt? High salt levels in my bacon don't really bother me. I have a high tolerance for it (!) and tend not to eat rashers of the stuff in a single sitting anyway so haven't with my previous attempts felt that it was too salty. I mostly use it sparingly as lardons as an ingredient in soups, sauces etc where I can control the salt levels of the overall dish. For this reason (using my bacon as an ingredient) I'm hoping to graduate to guanciale when I've got my streaky game down. But high poison levels in my bacon are another matter. So hoping to nail this safety issue once and for all this time. Not that I've felt unsafe from previous attempts (and they've been very tasty!). Just that there's a tiny .5% nag at the back of my mind that I'd prefer wasn't there. Sorry for the long post but I hope as much info as possible is helpful. Thank you very much in advance for any advice. Hi Hywel, plenty of questions here, but hopefully we can get them answered. @Wade is your man for most of this, but I will chip in with my comments. You do not want to use Plastic, OK a sealed container turning daily in my opinion would be OK. I would not try two cuts at the same time, the reason why. Double the weight double the cure, but you can not guarantee that each piece is getting the exact amount of cure, one could be heavily over cured, and one under cured. 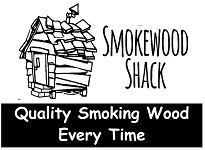 We normally recommend 10 days curing. You can not over cure, but you can under cure. And if it’s under cured it’s not fixable. Use a cure Calculator and you should not get “Salty” Bacon. Sugar Weight and finally the Cure #1 Weight on the pack, in you case a sticker on the lid, before I Weight anything out. 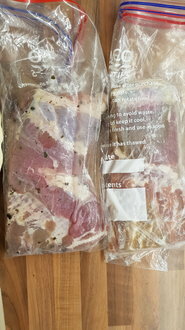 I have done Bacon curing and @Wade has as well, with out Cure #, in a plastic container. I will dig out the details and post them up. Thank you so much! That's very helpful indeed. Yes, I had my doubts about the stacked method so won't do that then. One piece at a time it is. Surprised about the 10 days thing. That's really interesting. Thanks. I can see the attraction now of putting it in a bag! A lot less admin over 10 days! A question about the bag method: The very fist time I made bacon was with a recipe that required loads of cure mix (like 500g or something, if memory serves), adding it in daily stages and pouring away any brine every day too. It drew loads of moisture out of the meat and the result was a very pleasingly firm-textured bacon. I've not been able to recreate this texture using the method with 5% cure, which I put down to there being much less cure and not pouring away the brine. 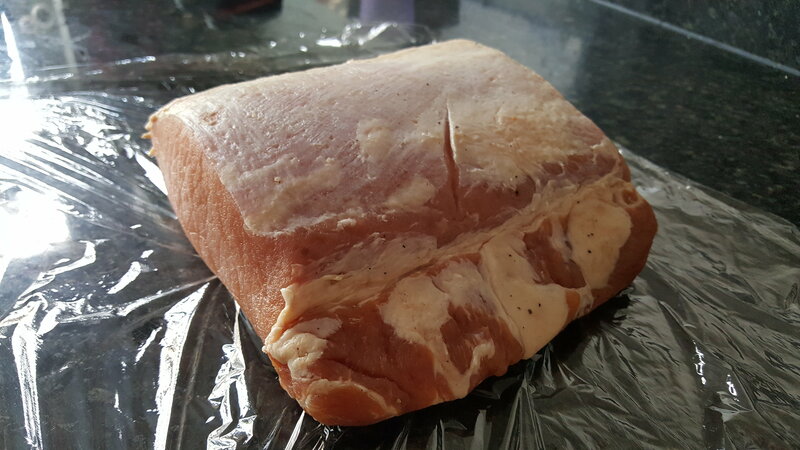 What sort of texture/dryness/moisture levels do you find you get in the finished bacon with the vacpac method? Writing the weights down on the bag/label is a good tip. Thank you. 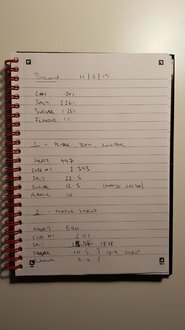 I've been keeping notes/calculations on pieces of paper before I start weighing anything but they usually get misplaced before the bacon gets to the eating stage! Putting everything together makes much more sense. I was planning on using Wade's calculator that I saw on a previous post somewhere (the 'Beginners Start Here' or similar post?). I'll also check out the local food heroes one. Thank you. 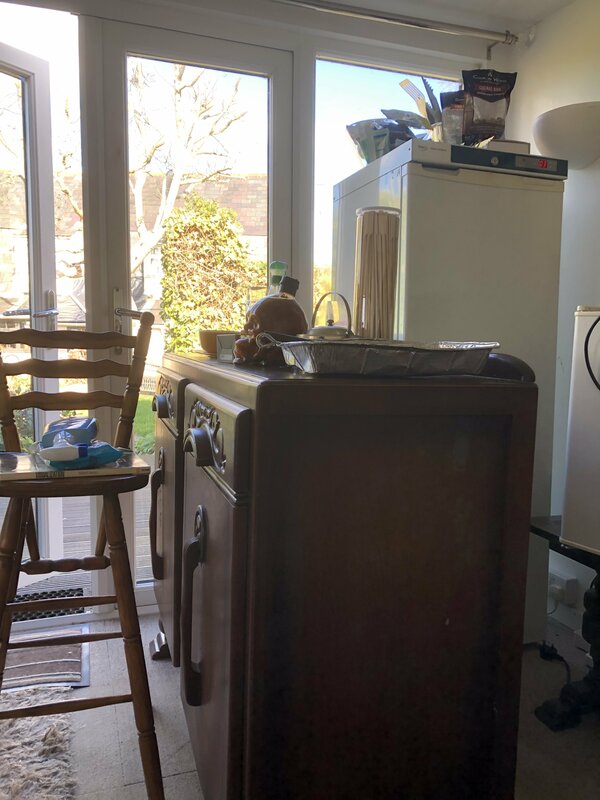 I've seen recipes (e.g. River Cottage I think) where they just use salt and sugar and flavourings with no Cure #. I haven't tried that yet but maybe as I get more confident? Just want to sget the basics down first with safety in mind then go from there. Thanks again for your help. so nice to have somewhere to discuss this stuff! You're in the right place to start off with, a lot of us are into making our own bacon, can't remember the last time we bought shop bacon??. We do vac-pack as we find it's easier for us as we do maybe 3 different flavours all at the same time. We can then pop them in the fridge, stacked one on t'other, turn daily, we go for the 10 and 14 days. When finished, we slice, bag and freeze.... we have splashed out on a bacon slicer it's so better than using a knife for us anyway. Thank you for your kind words above. To help people like yourself to become confident in their curing is one of the major reasons we set up the forum. There are strict UK/EU/UDSA regulations on the use of cures in commercially produced bacon and, as you would expect, these have safety margins built in to them. Over the last few years we have seen the amount of permitted cure almost half - from ~270 mg/kg (ppm) to 150 mg/kg (ppm). Even though this is the case, the EU and UK still allow higher levels of cure in "traditional" cured meat products. On the forum here we only recommend the use of the standard commercial cure levels and so you can feel safe using the calculations you see. 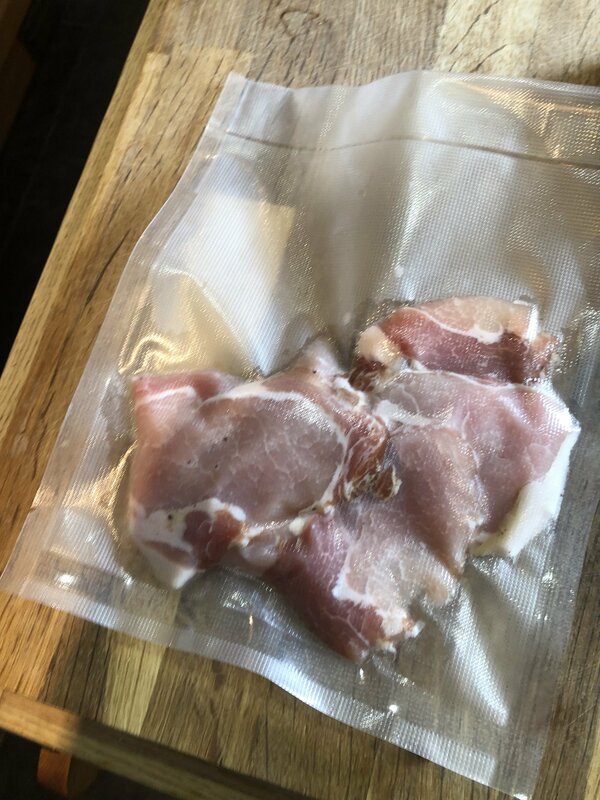 Unfortunately there are no legal cure limits when producing home made bacon and many of the widely available cures (like Supracure), when used at the recommended rate, can result in cure levels being double the permitted commercial levels. Should you avoid these home cure mixes? No, not necessarily. Once you become comfortable calculating the cure you are using (which you should ALWAYS do - even if it just for your own peace of mind) you can often adapt their usage rate to bring them back into line. Supracure for instance, when used at 50% of their recommended rate (e.g. 2.5% instead of 5%) results in salt levels of 2.5% and Nitrite levels of 150 mg/kg - a good result all round. The good news is that many of the newer cure mixes that are coming onto the home market do conform to the maximum commercial UK/EU cure limits. If the cure that you are thinking of buying does not tell you exactly what is in it, first contact the supplier and ask them to tell you the contents in writing. If they cannot/will not tell you then don't buy it. If you are making bacon then make sure that the cure you buy contains only NitrIte and does not contain any NitrAte as well. Of the two it is the Nitrite that is the active component and for relatively short shelf life products (like bacon) is the one that you need. The Nitrate is only required in the longer shelf life products (like salamis and other air dried sausages, or air dried meats like "Parma" ham, bresaola or pancetta). Here the Nitrate acts as a Nitrite reserve - over time it slowly breaks down to Nitrite to keep the Nitrite levels topped up. 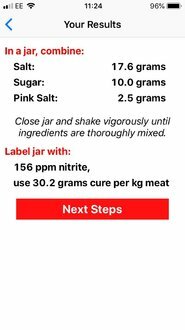 Using curing salts that include both Nitrite and Nitrite in something like bacon only means that you are using up to twice as much curing salt that you think you are. Limiting the Nitrite/Nitrate in your bacon is not really about making the bacon "safe" but more about helping to reduce the overall amount of Nitrate/Nitrite that we eat in our overall diet. When you eat your bacon steak with a good helping of cabbage, carrots and maybe some braised celery, it is likely that each of the vegetable portions could contain as much (or maybe even more) Nitrate/Nitrite than the bacon itself. The more accurately you can weigh the cure the better however we can sometimes get over paranoid over accuracy. We need to remember that meat is biological tissue and so each joint/belly will actually absorb different amounts of the cure. When calculating the levels we are measuring the amount of cure we are applying to the meat ("ingoing") and not the final final amount in it ("residual") and that you are eating. It all works on averages and so the residual amount in the end bacon will vary. Official testing over the years has shown that the use of the published maximum "ingoing" amounts will result in the "residual" cure being within the effective protective range. For a 1 Kg slab of pork belly you would need 2.4 g of Cure #1 (6.25% Nitrite in Salt) to give you 150 mg/kg ingoing Nitrite. However if you only has scales that measured to the nearest gram then providing you weighed out more than 2 g but less than 3 g of the cure you would end up with Nitrite levels somewhere between 125-188 mg/kg - and these are well within the upper and lower safety margins. The closer you can get to weighing the 2.4 g of cure the better though. Regarding the curing container... As we are carefully calculating the amounts of salt and cure (to provide a consistent quality of bacon) we need to ensure that the salt/cure/brine remains in close contact with the surfaces of the meat. The Pyrex dish approach would work for the techniques where we simply relying on an excess of salt for the curing process, however it is not recommended for techniques where we are using curing salts (e.g. Nitrite). This is due to the uncertainty of the amount of the cure that will be absorbed. To minimise the use of plastic you can use the ziplock food bags and remove as much air from the bag as you can while curing. After use the bags can then be washed out and re-used for your next batch. Not a complete avoidance of plastic but it will minimise its use over time. The use of bags like this keeps the fridge clean and allow you to cure multiple joints in stacks - one joint per bag. The length of time you need to cure depends on the thickness of the meat. For most belly joints 6-7 days is usually sufficient however loin joints (back bacon) will usually require 10-14 days. 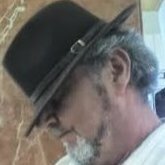 Within reason you cannot "over cure" so if you leave either types of joint curing for 14 days (which is what I do) then you are fine. If you want to only cure the belly for 7 days then that is fine too. The curing time is not dependant on the salt content. 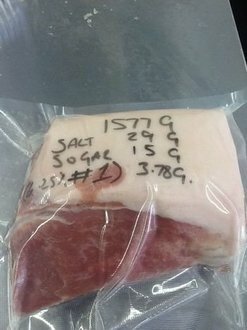 The calculated 5% or 2.5% salt is the estimated residual salt that has diffused into the bacon during the curing period. When you first apply the salt/cure to the meat the surface salt concentration will be 100% - this will kill most of the bacteria on the surface of the meat and give even the most resilient bacteria a very very bad day. 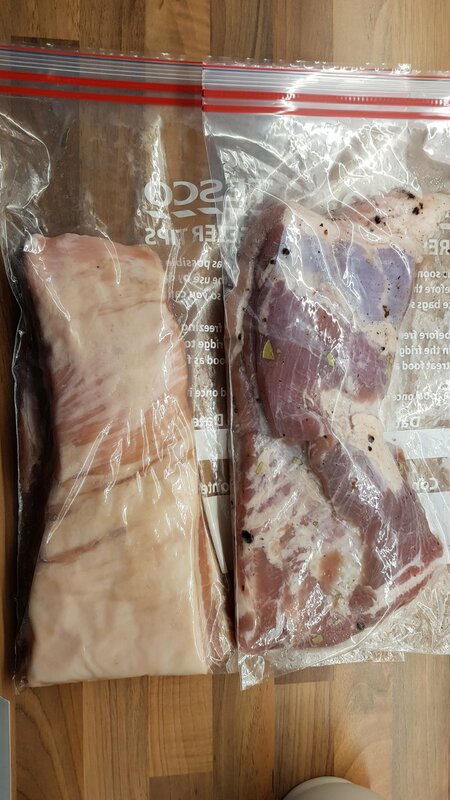 At that point the pork will be fine throughout the curing period so long as it is kept refrigerated. After the cure the slab of cured bacon will then be fine for about 6 weeks so long as it is kept refrigerated. 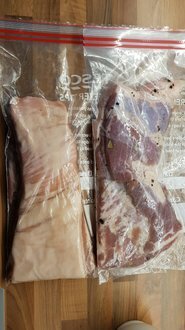 The salt does most of the preserving work however the Nitrite has some very important roles too - it gives bacon its "bacon" flavour, it inhibits the growth of botulinum and it prevents the meat fats from becoming rancid. My advice is to keep the levels of salt in your bacon low. 2.5% is a level that suits most peoples tastes. This level still makes good lardons - and if they are not salty enough for your recipe then just adjust the seasoning accordingly. The two end slices of the bacon will be more salty than the inner slices so you could save these specifically for lardons. Avoid any recipe that involves using curing salts that tells you to add more salt each day and pour away any brine. The results from this method will be so unpredictable it is, at best, a black art - and almost verges on alchemy. This method would be fine though if you are only using salt to cure, without the use of any curing salts. Sorry for the delay. The weekend got in the way, and I wanted to have time to read all your answers properly. Thank you so much for all the info. That is very helpful and reassuring, and definitely gives me more confidence now for the next batch. My pack of cure #1 arrived this weekend too, so I'll be hitting the butcher's tomorrow! Will do some belly and maybe a loin as well if they have a nice piece in. TBC. There's some maple syrup in the back of the cupboard that we've had for ages and doesn't seem to be getting used, so I'll put that in for flavour. Maybe I'll do a sweet maple one, and a not-so-sweet pepper and bay and juniper or something. Planning to smoke it too, but that'll be in a couple of weeks. Noted on the bag vs pyrex methods. Thank you. I do still have some big ziplock bags from previous attempts so will us those. Thanks so much again. I don't feel I'm blundering about blindly now! I will try to remember to take photos and keep you updated on my progress! have to say @Wade the bacon kit instructions and information is amazing! Buy some kits of Wade it’s easy even for dummies like me ! Wouldn’t it be good if someone wrote manuals for dummies !! So starts your bacon journey, well done. No looking back now. Nice bacon! I've just seen the kits in the shop here. They look very handy! I've had a crack today too based on Wade's instructions and measuring out cure and flavourings. A couple of small pieces of belly. Photos attached: calculating, measuring, bacon. Let's see what it's like in a couple of weeks' time! Here is bacon after cure and a bit of a wash in sink. Nice not too salty. I am now going smoke it on Friday. Wades pepper mix but I might put a light rub on it when I smoke it to spicy it up a bit. Morning. Bacon disaster today. Day 12 of the meat being in the cure. I've been away for work for the week. Was looking forward to seeing how it was getting on, and getting it into the smoker. But I've returned to find discoloured bacon. Opened the bags - it does not smell good. Rats! I'm guessing it's down to uneven application of the cure? It's been turned daily (wife's been doing it while I was away). Also surprised by how dry the inside of the bag is. Not much liquid drawn out of the meat. Oh well. It's a journey. We'll try again! Any comments/pointers about what went wrong welcome. There should be liquid in the bag. 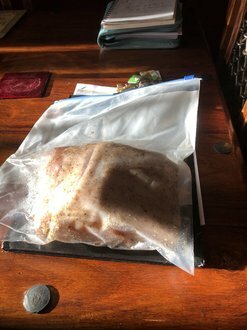 When I make bacon and use Vac Bags, I put the bacon in the Pork in the bag, and the last thing I add is the cure as it starts to draw moisture immediately, so makes it harder to seal bags. It is difficult to say exactly what has happened without a closer look at the bacon itself. The bags are obscuring the view of the meat. From what I can see the colour does not look bad and from your notebook you have used the correct amounts of cure/salt etc. 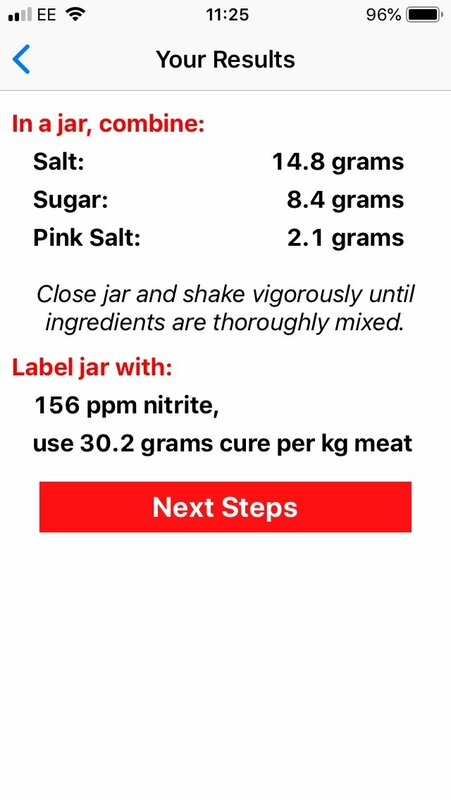 Just to make sure - you were using Cure #1 for this (6.26% Nitrite in Salt). I would not worry too much about the amount (lack) of moisture released. I find it varies greatly between pieces of meat. Some I get a lot of brine produced and others I get virtually nothing. 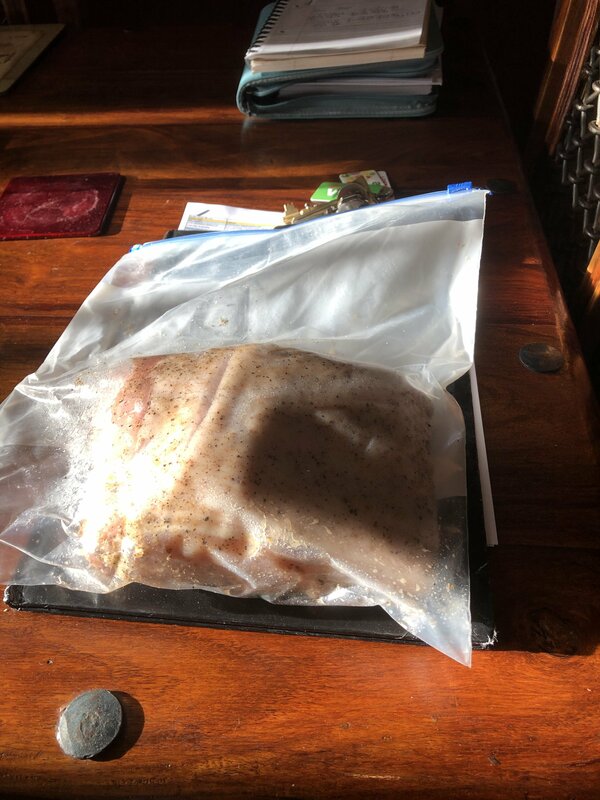 When you put the pork in the bag with the cure did you try to get as much air out of the bag as possible and wrap the bag around the meat to keep it in close contact while it was in the fridge. You want to minimise the amount of air that is in contact with the meat during the cure period. When you say the meat "did not smell good" what did it smell like? Did it still not smell good after you had taken the meat from the bag and rinsed it off? Finally ready ! I haven’t smoked it just had it au naturale . 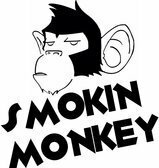 Will be doing this again and will smoke after I’ve built my cold smoker . will begetting more cute off wade in a couple of months . Outstanding product from him ! That looks green . Can I make a suggestion buy one of wades bacon curing packs . It’s so simple and self explanatory to use. Get a decent vac pack machine .